Run Thursday, Friday or both days! 4 run groups: Novice, Intermediate, Advanced (Point-by Passing),Advanced (Open Passing). Hooked On Driving specializes in safe, well managed events. All novice drivers receive coaching, coaching available upon request for all other drivers. We limit the size of run groups so everyone gets lots of open track...no conga lines! 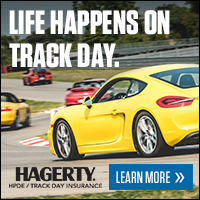 If your idea of a great track day is safe, friendly, fun and educational, give Hooked On Driving a try! Lunch included!